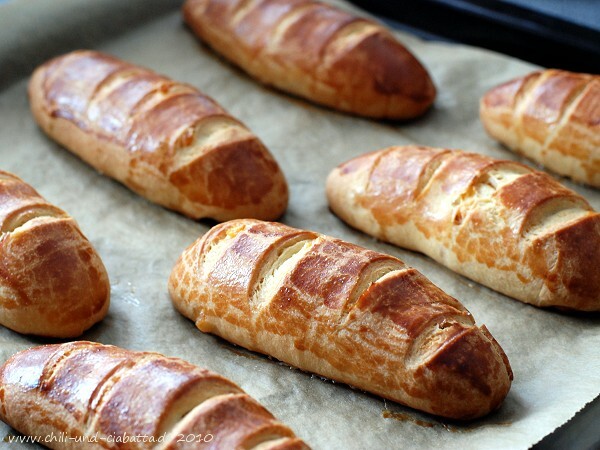 Tangerine’s Kitchen, hosting bread baking day #28, wants us to bake bread buns in march. The original recipe calls for candied orange peel. I didn’t have any because the family isn’t so much fond of it, so I substituted dried apricots. Anise seeds weren’t at hand either, so I used cardamom. …but finally they did bake nicely. Still warm from the oven they are brushed with butter and rolled in vanilla sugar. Doing a little research in my french cook books such as Provence-Alpes-Côte d’Azur from the series L’inventaire du patrimoine culinaire de la France, I think these buns differ a lot from the original Gibassié from Provence which is a kind of Pompe à l’huile (see thirteen desserts for Christmas), looking a little bit like a fougasse as can be seen here, here or here. Maybe this is an adaption sold in american bakeries as I learned in this blog entry. 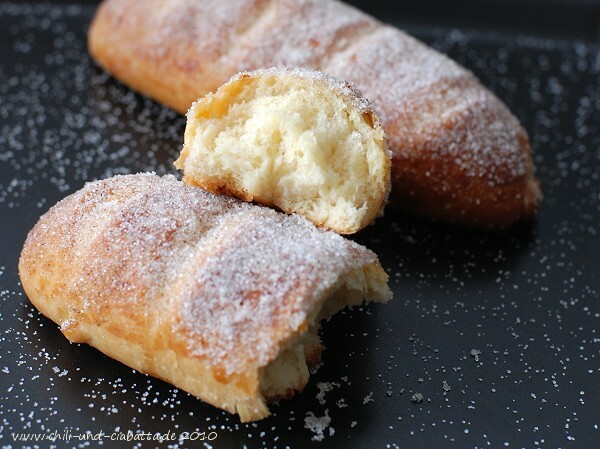 In the comments there you can also find a second recipe by Ciril Hitz for these sugar-coated so-called Gibassiers. Writing this entry I saw that the book Baking Bread at Home by the CIA didn’t get rave reviews at amazon. Can anybody tell me about good or bad experiences with recipes from this book? TO MAKE THE SPONGE, combine the milk and malt in a bowl. In a separate bowl, combine the flour with the yeast, then add this mixture to the milk. Mix the sponge together by hand for 2 minutes to develop some gluten structure and ensure that all the ingredients are combined into a homogenous mass. Cover the bowl with plastic wrap and allow the sponge to ferment in a warm area for 30 minutes, until double in size. incorporated, for about 3 additional minutes. The dough should have developed full gluten structure. Add the apricots and mix on low for 30 seconds to combine. Scrape down and flip the dough over, then mix for an additional 30 seconds. Place the dough in a lightly oiled bowl large enough for it to double in size and cover with plastic wrap. ALLOW the dough to rest and ferment in a warm place for 60 minutes (this took about 3 1/2 hours), until when touched lightly the dough springs back halfway (the dough now looked quite fatty-shining). 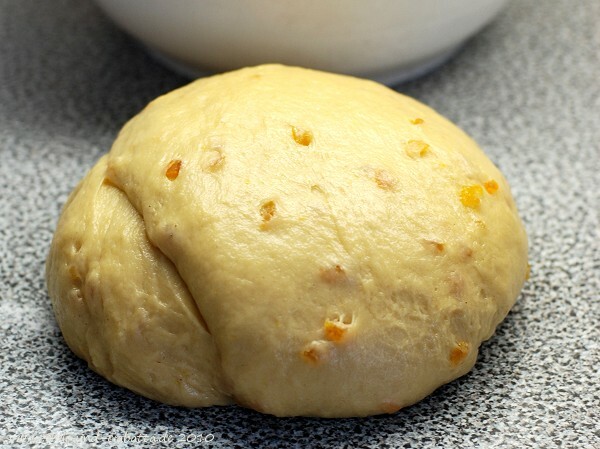 PLACE the dough on a work surface and divide it into 75-80 g-pieces. Round each piece against the tabletop, then cover the pieces and allow them to rest on the table for 10 minutes. SHAPE each piece into a 6-inch oblong. Using a sharp blade make 4 widthwise cuts in the center of each piece. Place the pieces of dough on two baking trays lined with parchment paper. BRUSH the pieces of dough with egg wash and lightly cover with plastic wrap. Allow the dough to rest and ferment in a warm place for 45-60 minutes, until when touched lightly the dough springs back halfway. (again this took much longer. I placed one of the trays overnight in the cold cellar. In the morning I let it rise 2 1/4 hours at room temperature before baking). PREHEAT the oven to 205°C (400°F). BRUSH each piece again with egg wash, place the tray in the oven, and immediately reduce the temperature to 190°C (375°F). Bake for 15 minutes, then rotate the trays and lower the temperature to 175°C (350°F). Bake for an additional 3-5 minutes, until golden brown. TAKE the bread out of the oven, allow to cool for 5 minutes on racks, then brush each piece with melted butter and roll the top in vanilla sugar. Allow the gibassiers to cool on racks over baking trays. Note Petra: If you want to freeze the buns, let them cool after baking and put them in plastic sacks into the freezer. 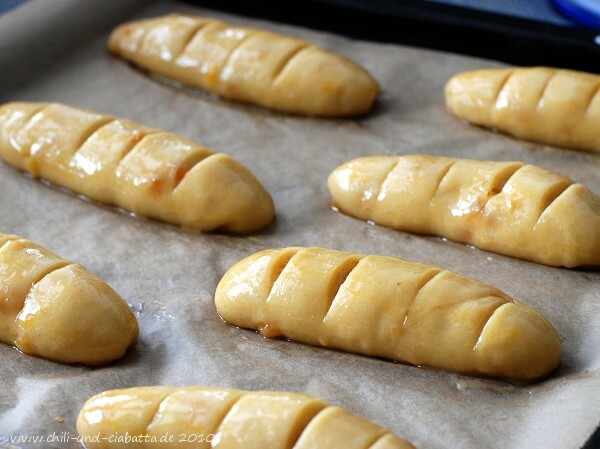 Reheat them in the oven (175°C), brush them with butter and roll in vanilla sugar. Checking my french baking books I think these buns differ from the original Gibassié from Provence which is a kind of „Pompe à l’huile“ (see thirteen desserts for Christmas). Die sehen ja super aus!!! Wenn ich nicht heute schon ein Hefegebäck machen würde, wäre ich schon in der Küche! Wird dieser Tage sicher ausprobiert. Kannst Du mir jetzt bitte verraten, warum ich gerade eine Bestellbestätigung von amazon erhalten habe?! Huiuiui, die sehen klasse aus! Gestern gab’s Deinen Schoko-Koma-Kuchen bei uns, der war auch toll. That is just beautiful.. I haven’t heard of such a bread..Thanks for the history too and thank you for sending this in for the event. Getrocknete Aprikosen finde ich als Ersatz übrigens ganz toll. Wenn ich jetzt zu René ins Spital gehe, dann „vergluschte“ ich in der Zwischenzeit…. Die sehen GRANDIOS aus und da muss ich mich wohl oder übel so schnell als möglich ans Nachbacken machen. Erzählen werde ich dem René nichts, aber vielleicht als Welcome-back-Gebäck…? Oh, je. Die sehen ja koestlich aus. Ich besitze einige CIA Buecher, dieses aber noch nicht. Werde das Rezept unbegingt ausprobieren mussen. Danke fuer den tollen Post. Wow..one of the prettiest buns I’ve seen thus far. 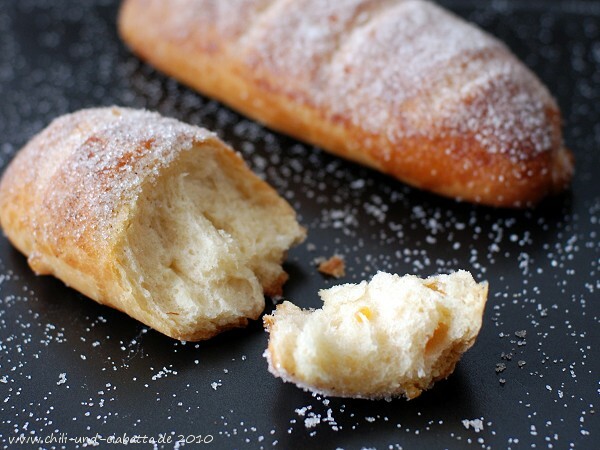 Definitely bookmarked as I love the buts of apricot with the crunchy sugar coating. Beautiful photos too! So eins hätte ich jetzt gerne zu meinem Kaffee. Danke fürs Mitmachen. davon hätte ich jetzt auch gern welche. Werde die am Mittwoch mal ausprobieren. Die sehen einfach nur zu gut aus.